Many men and women helped to shape popular images of the American West. Some of these people can be seen in a show at the National Portrait Gallery in Washington, D.C.
FRANK GOODYEAR: The individuals who you see pictured along this wall are all important players in that development. Frank Goodyear chose the pictures of more than one hundred individuals for the show. He says people from many different places and occupations influenced the development of the American West. For example, Joseph Glidden invented barbed wire. His invention helped separate land for farming. Theodore Roosevelt became president in 1901. Years earlier, he lived in North Dakota. FRANK GOODYEAR: When Roosevelt became president, he transformed this love of the West into concrete legislation, setting aside lands for national parks, national forests, initiating a vigorous national debate about conservation. Many people have heard of this businessman: Levi Strauss. 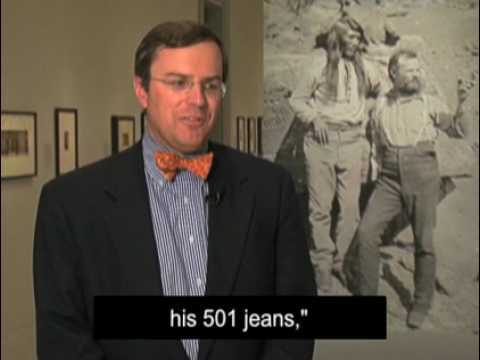 FRANK GOODYEAR: Levi Strauss comes to recognize that great fortunes can be made during the Gold Rush by supplying miners with the goods that they need, and realizing that a design for a waist overall is really very popular among the miners, and makes a tremendous fortune with his 501 jeans. The show has pictures of explorers like John Wesley Powell. He was the first white man to travel the full length of the Colorado River. There are also pictures of artists and photographers like Eadweard Muybridge. Goodyear says Muybridge was skilled at taking photographs of landscapes. His images and others had a major effect on the eastern United States. Many people there could not believe the beauty of the West. Writer Samuel Clemens also was important. FRANK GOODYEAR: Sam Clemens, who develops the pen name Mark Twain, really is the first individual to bring a kind of Western voice to American literature. His novel, Roughing It, really provide a larger American public with some of the colorful characters and dramatic stories associated with the West. The West had many colorful personalities: criminals like Jesse James, and bank robbers Butch Cassidy and the Sundance Kid. Entertainer Annie Oakley was famous for shooting targets. William Cody, or Buffalo Bill, was known for his Wild West Show. Goodyear says the National Portrait Gallery show covers eighty years during a time of great changes, in both the West and the United States. During this period, Native Americans and non-natives fought several well-publicized battles. Workers completed a railroad across the country. And the modern-day environmental movement was born. Im Mario Ritter.